Gators Robyn Hall spikes the ball during the game against Cal State East Bay on Sept. 24. The Gators won the game in a shutout, 3-0. Photo by Hang Cheng. Still showing signs of elation after last night’s win, the SF State volleyball team carried its momentum to another 3-0 sweep. 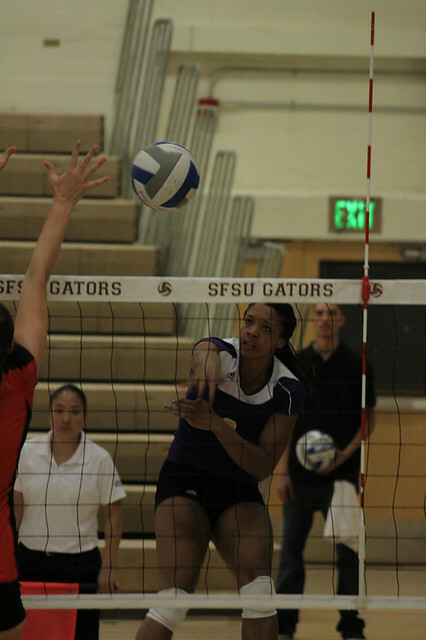 The Gators defeated the Cal State East Bay Pioneers 25-21, 25-22, 25-7. The first two sets were evenly matched between the two teams, but it was clear from the first points of the third set that it was the Gators’ night. Williams had 12 kills and several key blocks for the team. The teams retreated to their meeting rooms for the traditional post-second-set break, and when they returned everyone seemed like different players. Where the Pioneers had been slightly scattered and uncoordinated before the break, they were defenseless after. The Gators had used determination and luck to win the first two sets but they were going to make up for their mistakes in the third. The Pioneers only scored two points back-to-back in the third set, while the Gators led by as many as 18 points twice. The team is already thinking about how to carry their momentum into a big road trip to Southern California next weekend, when the team plays three games in as many days. “We’ll work on trying to stay consistent, longer. We’ve got three games in a row so we’ll have to be mentally prepared,” Robyn Hall said. Teammate Iris Tolenada thinks this weekend proved they can do it. “Knowing that we can take one game and win another one in three with just a day of preparation, it’s a good thing for a team,” she said. Tolenada played a crucial role in the win, leading both teams with 40 assists. “It was just a collective team effort,” she said.